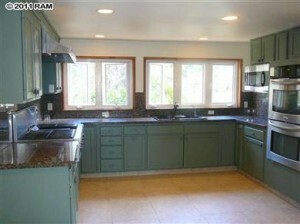 If you are looking for a property on a large acreage, some of the most beautiful Maui estates are located Upcountry. This one, pictured above (MLS# 349729), just came up on the market in Kula 200 and sits at the top of the subdivision on 3.8 acres of gentle rolling hills and beautiful large trees. The private 2nd entrance from Hoopalua Drive gives you access to the upper portion of the parcel where you can build an accessory dwelling permitted for this Ag zoned lot. The custom house has a unique floor plan and provides lots of great opportunities for this very special home and land. It’s ready for a large family and someone to give it a little TLC. View a video of this property atop of Kula 200. Most of the properties of Kula have stunning bi-coastal ocean views, amazing central valley views, as well as views to other islands such as Kahoolawe, Lanai, or Molokini. Many properties are agriculturally zoned producing gorgeous proteas, strawberries, all types of green leaf vegetables, or growing mango, avocado, banana, or citrus trees (to name a few). Jacaranda trees, with their clusters of fragrant purple, trumpet-shape blooms, line the roadways UpCountry. They bloom for one month during springtime and at different times according to their location on the mountain. For more detailed information and pictures about this property, please contact me. View the 10 most affordable Kula properties for sale.